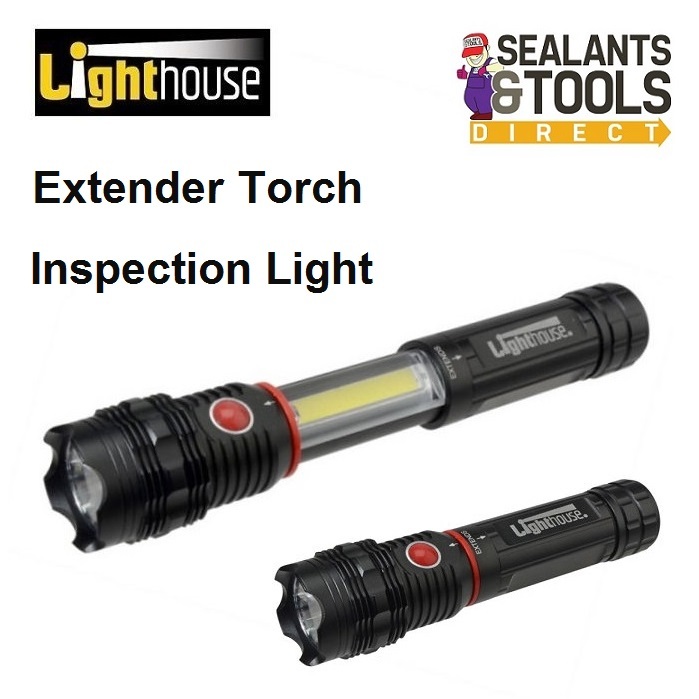 The Lighthouse Super Extender Inspection Light and Torch has a versatile design it encorporated a magnetic base that also makes it suitable for the motor industry in and around engine bays for hands free use and many other applications. The shaped torch also allows the torch to be placed on its side without running away another good benefit. 1 - Hand torch using its 3 Watt LED, 150 Lumen spot beam. 2 - Inspection light utilising its slide out super-bright liner COB LED, providing a 200 lumens output floodlight. An ideal torch for inspection work and general illumination. Depending on the output mode selected the lamp will provide up to five hours of continuous illumination. These great features combine to make this torch the ideal choice when a concentrated beam of light and a floodlight may both be required. This torch is an ideal choice for inspection engineers, mechanics, plumbers and any application that also requires a spot beam for distance location. Its compact size allows it to fit neatly in to a toolbox, glove box or drawer. Requires 4 x AAA batteries (Supplied).